I loved Battlefield 1942 and the newer Battlefield Vietnam so I was really looking forward to Battlefield 2 with my only worry being would it be more of the same i.e. new maps and that’s it, or would they be able to add new elements to the game without ruining the gameplay. Thankfully it’s the latter. 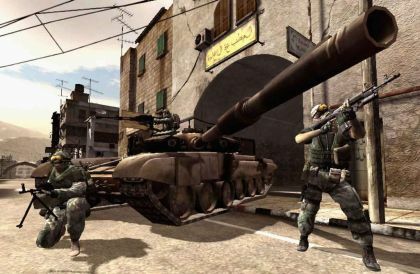 The best thing about the Battlefield series was the sandbox approach to gaming. A large map, a range of six different character types that really did give you alternatives and then the ability to do what you want in the game was great and refreshing 2-3 years ago when it came out. I could drive jeeps, tanks, troop carriers, planes, helicopters and then I could man boats, anti-aircraft missiles, machine gun placements. All this while being a medic, engineer, anti-tank or just a plain old soldier. Could also parachute out of planes so making crossing the map very easy. Battlefield 2 has all this plus more. The maps are now bigger and far more detailed, as too are the player models. The range of vehicles has also increased giving you even more options. The maps also have more buildings and objects to take advantage of. Climb to the top of a massive crane, snipe until you run out of bullets, jump off and parachute (it is that high) into a battle and take out an enemy with your grenades before being run over by a tank. Superb. The maps also make use of height in the terrain – parachute in from the top of a cliff edge adds a new dimension to the game. Also new to the game is a bigger element of strategy. There is a new commander role – one player takes the role during the game and can order air and artillery strikes, supply drops and also talk to squad leaders. Squads are also new – you can have many squads and squad leaders but only the leaders can talk to the commander which is vital in organising troops and attacks in the game. The game also borrows some ideas from Xbox Live. The squads can talk amongst themselves using VOIP. Also you have a persistent username so that stats can be tracked over the life of the game and the stats on offer are very detailed. Importantly though the game one-ups Live by offering 64 player support. The Jolt servers in the UK are excellent for this and the games are lag free and I’ve only crashed out of a game once over the last week which is pretty good going. A downside is that loading takes forever with this game – make sure you’ve a magazine handy while the game loads. Apart from that there is very little to fault – a superb game that shows the consoles how FPS gaming should be done online. Buy it.